J&K Bank Recruitment 2018 - Below are various recruitment notifications published by Jammu and Kashmir Bank Ltd / www.jkbank.com. As of now, we don't have any active recruitment notification by J&K Bank featured here. We may update as soon as the organization announces a new job notification. If you are looking for any information related to previously organized recruitment drives by J&K Bank, you can browse through previous job notifications mentioned below and get the new updates or information you are looking for. J&K Bank Recruitment 2018 - Apply Online for 250 PO Posts in J&K Bank, Across India. 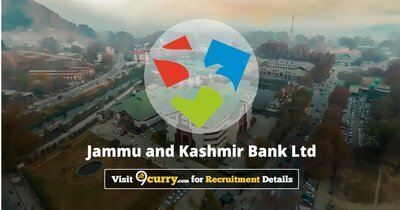 Online Applications are invited by Jammu and Kashmir Bank Ltd from 20 Oct 2018 to 06 Nov 2018 for 250 vacancies.